I LOVE food and I bet you do too! It's especially enjoyable when food encourages life, living and fun! Nature send us lots of information hidden within our food, and over the years I've collected a few fun food messages from Mother Nature. Developing food awareness may help you savor your fruits, veggies, nuts, seeds and teas more, and seeking out Mom Nature's memorandums makes eating them even more nourishing. I couldn't resist modifying this Japanese sweet potato. I wonder if this could be considered a GMO? ha-ha!! Eat your veggies. This picture was taken on a fun trip to the botanical gardens in Albuquerque; I must have been hungry! The shapes of foods are always interesting. I picked this sweet potato because of its' likeness to one of my favorite creatures on earth. Can you guess? Veggies give you wiiiinngsss! Thanks to my friend Mike who found this surprise when cutting open a green pepper. I'm certain nature was sending him what he needed, and then he was kind enough to share his message with me. Thanks Mike! 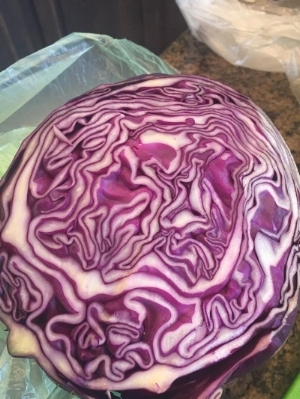 I was amazed when cutting open this purple cabbage and it revealed it's BRAIN! Wow! Cabbage is is in the family of cruciferous vegetables-. This family likes to feed our cells- including the ones in our brain. Dates.... also look like bugs, especially if you stick rice grains in them for antennae. They are still an excellent treat if you have a sugar craving- eat one and done! Plus they keep you regular! Blue Monarch Health, PLLC will help you find LIFE, LIVING and FUN in your food. Click Let's Talk to learn more. I bet you've received important messages from Mom Nature. Share some of them with us in a comment. Newer PostThe Beginner’s Mind, for Personal Growth.